Un grupo de arqueólogos que estaba elaborando una base de datos recopilando los diversos ejemplos de arte prehistórico en una zona cercana a la frontera con Escocia, ha descubierto al menos 250 tallas nuevas sobre roca. Ya son más de mil las tallas catalogadas y expuestas en la página web del proyecto, conteniendo más de 6.000 imágenes de esta rica herencia artística. La zona investigada se halla en Northumberland. Después de dos años y medio de recorrer el territorio y de registrar todo lo que encontraban, los científicos de la University of Newcastle upon Tyne han puesto a disposición del público una gran cantidad de información sobre el particular. Noticias de la Ciencia, 28 de enero de 2005. Los expertos, sin embargo, siguen sin definir exactamente los orígenes y el significado de las tallas abstractas que caracterizan el arte prehistórico local, protagonizadas por círculos y huecos, si bien existen diversas teorías. Creen que fueron hechas por gentes del neolítico y de principios de la edad del bronce, hace entre 6.000 y 3.500 años. Entre los nuevos hallazgos se encuentran 14 piedras en Goatstones, cerca de Wark, que habían pasado desapercibidas hasta ahora por los científicos. En otro lugar, un granjero avisó al equipo sobre otros siete paneles presentes en sus tierras, que tampoco habían sido catalogados hasta la fecha. La colección más grande de arte rocoso del país, encontrada en un solo lugar, se halla no obstante en Roughting Linn. La labor principal de catalogación ha sido llevada a cabo por los veteranos especialistas Stan Beckensall y Aron Mazel. Su labor ha permitido preparar una página web en la que se presentan los resultados obtenidos. Uno de los objetivos de la iniciativa ha sido sin duda promover el conocimiento de esta interesante parte de la historia de la región. Gracias a las herramientas modernas, incluyendo Internet y la digitalización de documentos, los datos están a disposición de historiadores aficionados y profesionales. Para el gran público, la información es un motivo más para visitar la zona y disfrutar de algo tan antiguo. More than 250 new examples of England's finest array of prehistoric rock art carvings, sited close to the Scottish border, have been discovered by archaeologists compiling a unique database. Now over one thousand of the 'cup and ring' carvings can be admired on a new website, which carries 6,000 images and is said to be the most comprehensive of its kind in the world. The site, which goes live today, includes the 250 panels unearthed during a two-and-a-half year trawl of some of England's remotest countryside, in the expansive moorlands of Northumberland. Experts, however, are still grappling with the origins and meaning of these abstract carvings, believed to be the work of Neolithic and Early Bronze Age people between 6000 and 3500 years ago, although there are several theories. Among the new discoveries made by the University of Newcastle upon Tyne archaeologists is a collection at Goatstones, near Wark, where a haul of 14 carved stones was spotted and recorded for the first time. Elsewhere in the county, a local farmer alerted the team to seven panels on his land, which had not been previously recorded. Old favourites will also be featured in the website, such as the country's largest collection of rock art featured in one place, at Roughting Linn. 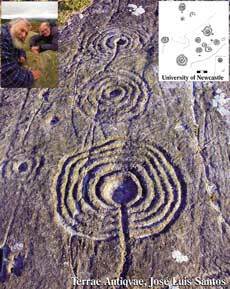 Inspiration for the project came from the Northumberland rock art specialist, Dr Stan Beckensall, who donated his archive of books, photographs, drawings, rubbings and more to Newcastle University. Funding from the Arts and Humanities Research Board enabled Dr Stan Beckensall and University archaeologist Dr Aron Mazel to take things a step further. For the past two and a half years the pair have been updating and expanding the resource so that a comprehensive archive accessible for all elements of the international community - academic and school children alike - can be made available. The new website, which goes live today, has been created with the help of Heritage Media, a company specialising in the design of websites for heritage topics, set up by Newcastle University graduates Jessica Kemp and Marc Johnstone, together with computer database and website expert Horacio Ayestaran. The principal investigator was Prof Geoff Bailey, previously at Newcastle University but now with the Department of Archaeology at the University of York. An archive featuring around 6,000 images, including 360 degree photographs ('bubbleworlds') showing rock art in its landscape setting, drawings, digital images, and digitised slides and negatives. Project leader, Aron Mazel, of Newcastle University's School of Historical Studies, said: "It's incredibly important that we are aware of our heritage, not least because it helps us understand our own origins and identities. Our team has spent the last few years on a prehistoric 'adventure' and now we're at the stage where we can share our finds with others. "The Beckensall archive gave this project a head start but we've also been very excited to find new specimens of this very special art. There are likely to be more carved stones there hidden under the undergrowth so we're sure this is not the end of the story," said Dr Mazel, adding that he hoped that the information presented on the website would encourage further research into this special archaeological resource. Stan Beckensall added: "One of the key aims was to promote widespread enjoyment of this fascinating part of our history, and the web was the obvious medium to reach out to the 21st century historian, amateur and professional alike. "I'm sure the artists who hammered their symbols on the stones thousands of years ago, on their windswept moorland settlements, never imagined their work would become such a world phenomenon as this!" "The site is great news for visitors looking to explore the region's amazing and little known historical treasures including ancient rock art, Iron Age hillforts and standing stones. "Hopefully this will whet the appetite of many would be visitors, keen to see these rock features in the flesh, and give people an extra reason to make the North East of England a place to visit this year."